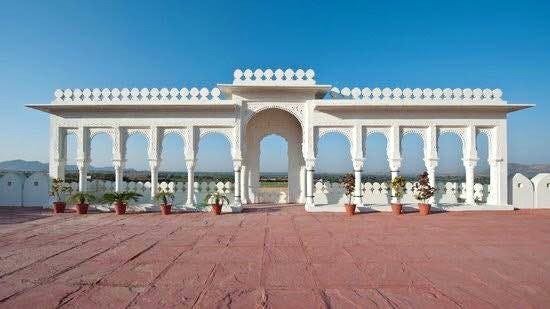 As you exit the hustle bustle in the city of Pushkar, leaving behind the various temples, you arrive at Aaram Baagh resort by going through the sites of camels that will scare as well as charm you. A narrow lane worn down by cars takes you to a beautifully made reception where the humble people of Pushkar take you to your room. They offer you different varieties of rooms which are designed as per the civilisations they are named on. I stayed in the Arabian Villa, shaped like a small house with an attached pool and balcony for the guests. They ensure utmost privacy in these villas by having only a set of two together. In the morning, the sun shone into our cottage making the bright white ethnic drape shine and brightening up the room. The resort was fully encompassed with a sunset point, and gardens to sit and relax in. A number of experiences were offered such as a tractor ride - taking you inside the resort on a tractor, cultural nights - showing men and women dancing on melodious music played by the table and flute, and an evening market containing the best street foods from north India having the ever famous Kulhad Chai as a part of it. The food could use an upgrade.